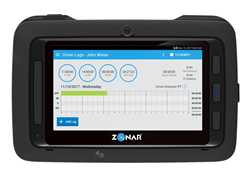 Zonar, the leader in smart fleet management technology, announced today that Zonar Logs available on Zonar Connect and 2020 tablets, received third-party validation by industry veteran Annette Sandberg, former Federal Motor Carrier Safety Administration (FMCSA) administrator and nationally recognized expert in public safety. Sandberg conducted independent testing of Zonar Logs and has verified that it meets the complex FMCSA Electronic Logging Device (ELD) standards. Zonar Logs can be found on the FMCSA list of registered Electronic Logging Devices. As a former FMCSA Administrator, Sandberg is very familiar with commercial motor vehicle safety and security on our nation’s highways at Federal and State levels of government. She has a vast background in the trucking industry and was the guiding force of the HOS (hours of service) reform for truck drivers. Throughout her career, she has also served the role of Deputy Administrator of the National Highway Traffic Safety Administration and was the first female to lead the State Patrol as Chief. Currently, Sandberg is CEO of TransSafe Consulting. Having an ELD device fail on the road, or one that is found to not meet FMCSA standards during an inspection can cause issues for both the driver and the fleet manager. A driver needs to be able to share the current day and previous seven days’ worth of logs if requested by an inspector during a roadside check. Failure to provide logs when asked will result in a violation for the driver and penalties for employers. With third-party testing, 24/7 customer support and ELD compliance Zonar Logs customers can be confident their vehicles and drivers are in compliance with the mandate that goes into effect on December 18, 2017.